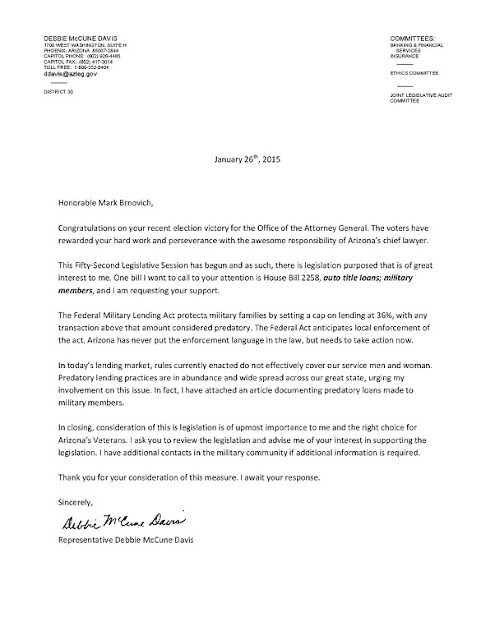 Will AZ Attorney General Support Efforts to Protect Service Members from Predatory Lending? Today, the president announced expanded protections against predatory lending for members of the military. Rep. McCune Davis called on Arizona Attorney General Mark Brnovich to support a bill earlier this year that would have allowed for better enforcement of similar protections for military families. The Federal Military Lending Act protects military families by setting a cap on lending at 36%, with any transaction above that amount considered predatory. The Federal Act anticipates local enforcement of the act. Arizona has never put the enforcement language in the law and that needed to change quickly with HB 2258, auto title loans; military members. The bill was held in committee during the legislative session and never received a full vote. Rep. McCune Davis is still waiting for the attorney general to reply to this request and he has not given her any indication that he will support similar legislation in the future. On Monday morning a group of community leaders, advocates and legislators met at the Capitol for a press conference and rally demanding more accountability and an independent investigation of the for-profit, private prison system. 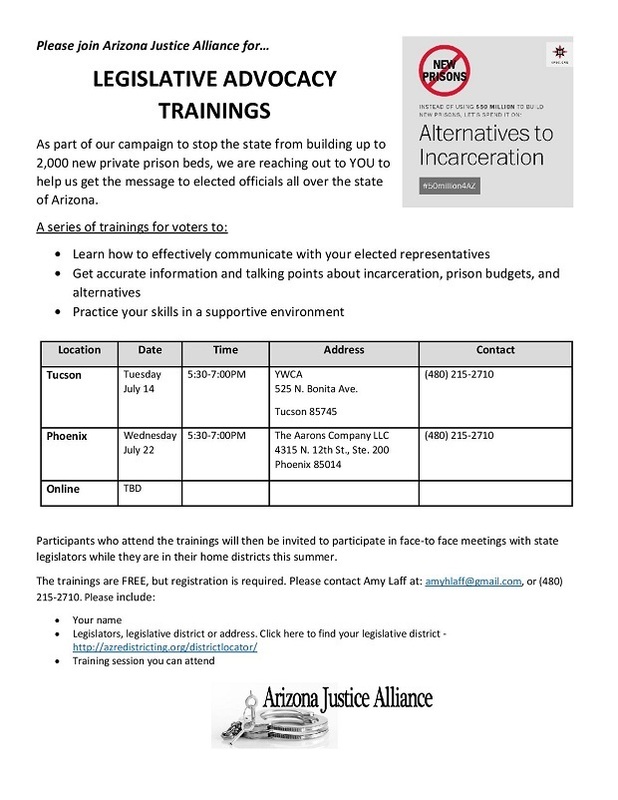 People from across the state joined a growing chorus calling for the governor and the Department of Corrections to cancel the bidding process for the new private prison beds that Republicans in the state have committed to build. Last week, the Department of Corrections announced it delayed the deadline for bids on a new private prison for two months while officials investigate this most recent incident. This news came after Democrats in both the Arizona House and the Arizona Senate called for a delay in this process, but community leaders and advocates remain skeptical that 60 days is enough time to complete a thorough investigation. Additionally, the governor is allowing the DOC to investigate itself. This is unacceptable; especially since the riot, which left 16 people injured, occurred in the same facility that allowed three inmates to escape who then went on to kill two people. People are publicly expressing doubts about the DOC’s ability to investigate itself - and for good reason. 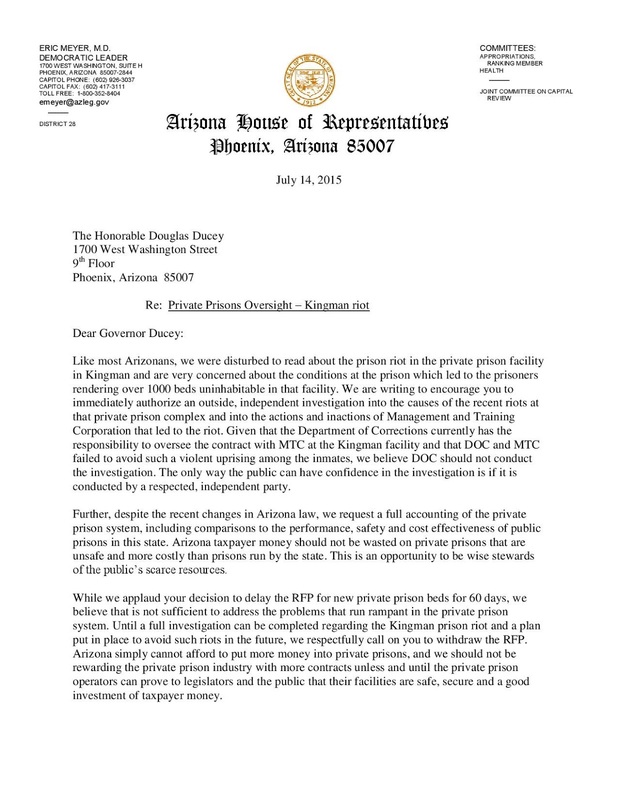 For years, House Democrats have urged for more accountability for all prisons including private facilities. 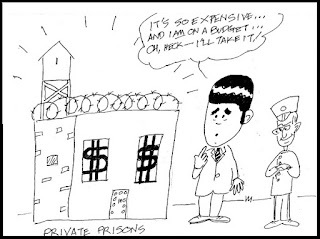 Republicans instead have pushed for more facilities while reducing oversight by repealing a state law that required a comparison of state and private prisons every two years to ensure that private prisons were providing the same quality of services as state prisons at a lower cost. The for-profit, private prison system clearly has problems. And Arizonans are demanding accountability. 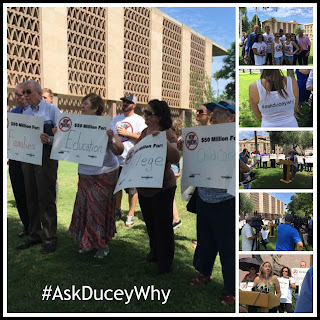 People across the state continue to #AskDuceyWhy these profit-driven facilities are still getting state support from Republicans despite ongoing concerns about safety and responsible use of taxpayer money. 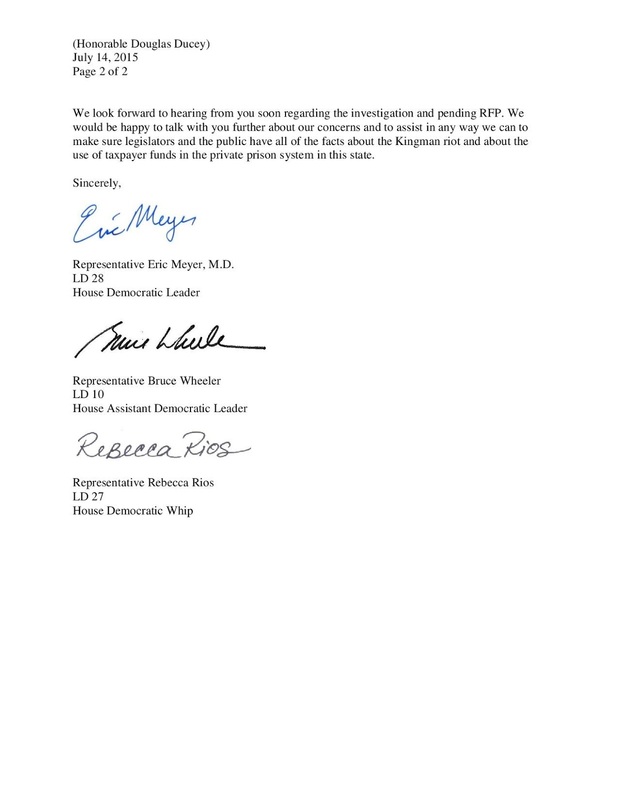 Today House Democrats sent a letter to the governor calling for an independent investigation of the recent riot in the for-profit prison complex outside of Kingman, a full review of the private prison system, and to extend the delay on the new private prison RFP until the investigations are complete. 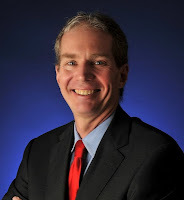 Just one day after affirming Arizona’s Independent Redistricting Commission’s (IRC) ability to create the boundaries for congressional districts, the U.S. Supreme Court announced that it will take up a case challenging the population distribution in the legislative districts that the IRC set. 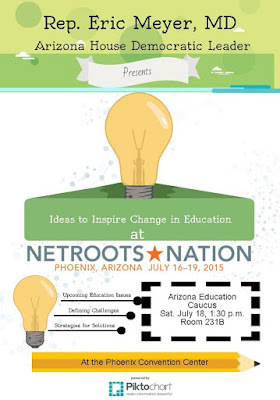 So the Republican-led spending spree to fight the voter-created IRC continues. Because the IRC is funded by the state, more tax dollars will be spent litigating an issue that should already be settled. 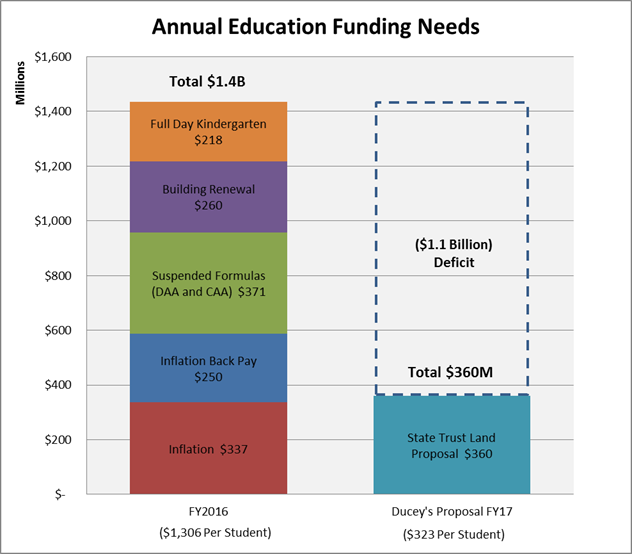 A recent news article reported that the full cost of the redistricting legal challenges is more than $5.3 million, including $1.73 million the IRC has already had to spend in the case the Supreme Court just agreed to hear. 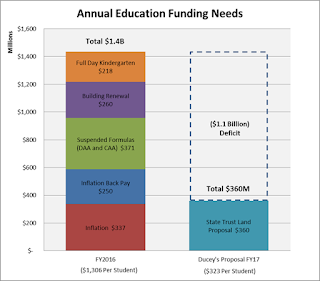 Arizona taxpayers can expect to continue shelling out cash for this Republican power grab. A group of Republican Party activists are leading the charge with this lawsuit, and they seem to be pushing a partisan agenda. That is exactly what most voters in Arizona wanted to keep out of the redistricting process when they created the IRC by citizen initiative in 2000. 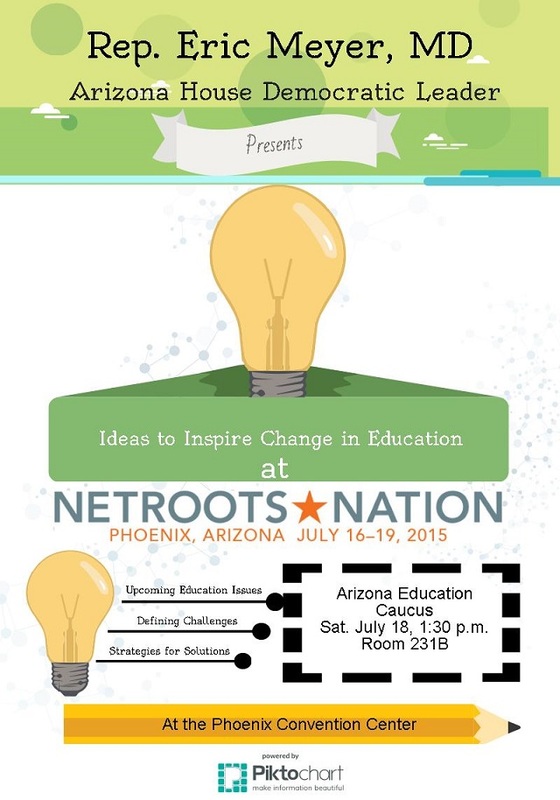 Most Arizona voters want redistricting out of the hands of the Legislature. They clearly prefer an independent organization in charge to help remove partisanship and personal political ambition from this important process. The Republican leaders and activists in this state must answer to Arizona’s voters. 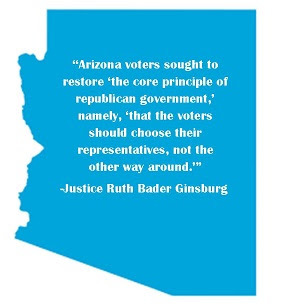 In the opinion Justice Ruth Bader Ginsburg wrote regarding the most recently decided IRC case she said, “Arizona voters sought to restore ‘the core principle of republican government,’ namely, ‘that the voters should choose their representatives, not the other way around.’” We agree.